Unfortunately, I did not come around to Dino's music until he passed away. Even though it was Christmas day, Grandma was not in a joyous mood. While one of his cd's was playing in the background, a song that I had heard countless times before, finally resonated with me...Innamorata. I saw how it brought tears to my Grandma's eyes. Since I was just starting to collect 78s at this time, I thought it would be fun to also round up some of Dino's tracks. Purple Capitols were found in abundance everywhere I looked. Even grabbed a few on eBay at decent prices. Then I discovered that he had recorded 10 sides...5 discs...before he embarked on his massive Capitol output. In the 16 years that I have been collecting Martin 78s, I have all but one. It hasn't been the case of being outbid at the last second or finding it in an antique store only to be cracked or unplayable...it's that I have never come across one...online or in person...for sale, on display, mentioned or otherwise. 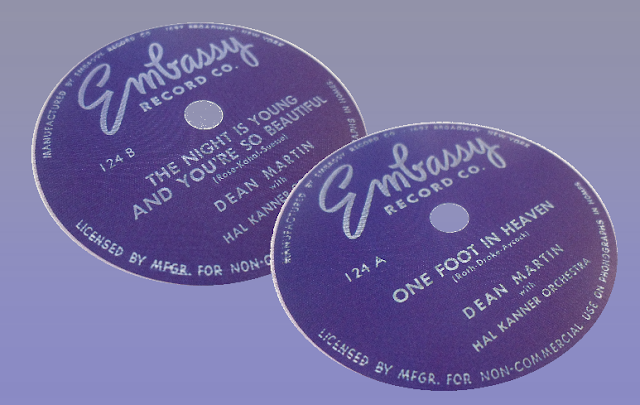 In late November of 1947, Dean Martin recorded One Foot In Heaven and The Night Is Young And You're So Beautiful for Embassy Records just before a recording ban went into effect on January 1, 1948. [Dear DMFC: I wanted to reply to the person who asked if anyone has a copy of Dean's 78 recording on the Embassy Record label. The answer is "Yes". We (Record Review & Prices) did a story of the most valuable record discs of all time, and Dean's Embassy recording of "One Foot in Heaven" was included in the top 100. But...just last week, there it was in my inbox. I had to read and re-read the listing many times over. For five days, I couldn't think much about anything else. I left the window open on my computer just to remind me every time I sat down at my desk. After a very anxious auction process, the record became mine. The only obstacle left was the ride in the US Mail. Now...I can finally say, without a doubt, that the record does indeed exist after having arrived in the mail safely today. This is my personal Zulu's Ball or Original Stack O' Lee Blues. I just wish my Grandmother was here to see it...although I have a feeling she already has. And just found and obtained...the only other pre-Capitol release that I was missing. Not a 78 but rather an EP containing the Apollo sides. Hey...did Dino ever record 'Till Then.' I know he sung it live but was it ever on vinyl? 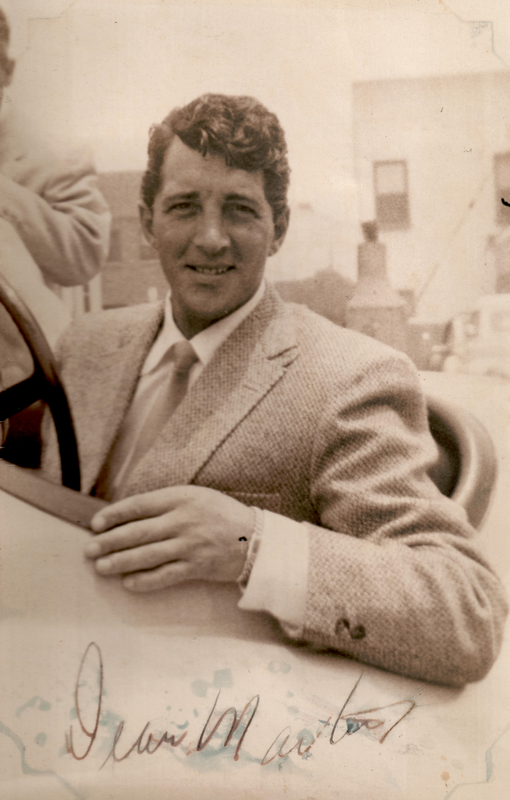 I have a Popular Records 78 (Record-O-Mail Co., Newark, N.J.) that contains six songs, one of which is Dean's Oh, Marie. Rare or not? I'm not familiar with it at all. Can you send a photo to heypally78rpms@bellsouth.net ?